The Super Soaker SS 300 is Larami's first generation of backpack Super Soaker created. This blaster sported a hefty 6.5L backpack with a hose to feed the blaster unit which housed about 1.5L of water in its three air-pressure-based firing chambers. The nozzle opening on this blaster was larger than any other water blaster found during its time. The SS 300 produced a stream that even rivals more recent CPS-class blasters. Its trigger-mechanism is the top-mounted lever found near the nozzle of the blaster. The limitation with this type of trigger is that one cannot pump and fire at the same time. The pump of the blaster moves roughly 80mL of water with every pump from the tank into the firing chambers. The blaster is connected to the reservoir via a clear hose with a shut-off valve at the blaster side. Interestingly, the hose could be detached from both the blaster and the reservoir. The backpack reservoir, itself, has two straps for mounting on one's shoulders. Its backpack, however, is not that comfortable to carry due to its non-flat surface which ends up in contact with one's back during transport. The backpack can be filled through either of its caps. While the SS 300's output and power were definitely unmatched in its day, the general feel of the blaster is rather flimsy. The handle on the blaster as well as the handle on the trigger section are actually shipped detached from the blaster unit and must be snapped into place. The firing chamber tanks are large and the blaster gets top-heavy when the firing chamber is full of water. Quick-pumping is not recommendable. The SS 300 is a powerful blaster, but potentially high maintenance due to concerns over its durability as many others have noted as well. Overall, the Super Soaker SS 300 is a potent blaster, able to outclass any SS or XP-class blaster and on par with even the mid-sized CPS/Monster series. Power, performance, and water supply are near the top for any Super Soaker . Its main drawbacks are its weight, awkwardness of the firing mechanism, and its overall lack of durability. The water supply is large enough to last a good deal of time even in the wildest of squirt-fests. Its sheer size also makes one's opponents think twice before coming within range. The size of the firing chamber lets one unload extreme amounts of water. Heavy on the back! The backpack should have been designed a little better. One nozzle setting means that one cannot conserve water when one it low. The structural design of this blaster makes it not very durable. Do not fall while carrying this blaster. 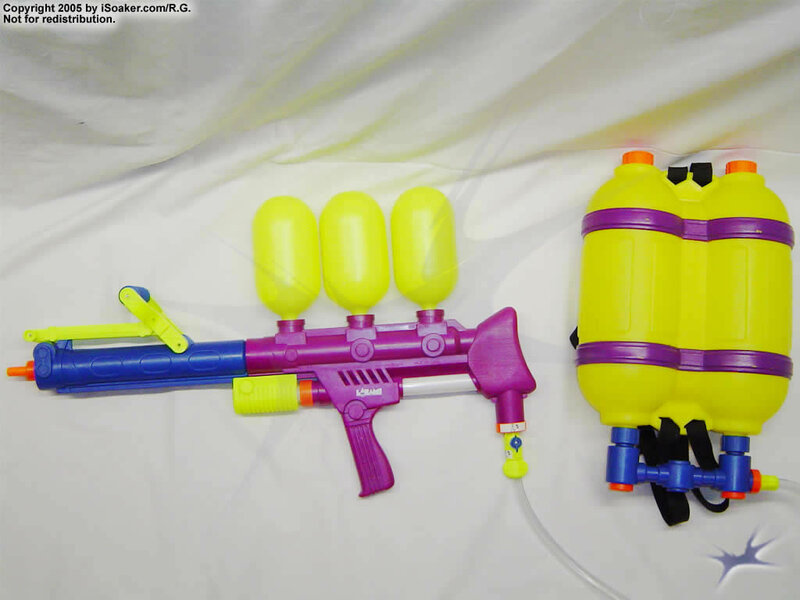 The Super Soaker 300 is the largest super soaker ever made by capacity holding a massive 310oz of water when pressurized making it a relatively slow weapon. Being one of only 2 blasters with a range exceeding 50' it's a great weapon for providing cover fire for your men. The greatest strength about this weapon is the unbelievably massive 3oz pump stroke, which means that you seldom need give this more than 1 or 2 pumps to rebuild full pressure after a tap or burst shot. When in action while you probably can't outrun much, you can outgun and/or outlast everything on the field leaving a wave of destruction in your wake. About my beloved SS300 Original. I am sad to read that little is known of this magnificent piece of aquatic artillery, so I thought I'd just tell whoever reads this mail a little about the SS300. It is quite correct that the SS300 is fragile. I've had to repair mine a few times. The trigger mechanism is especially vulnerable. Last time a repaired the trigger, I replaced most plastic parts with steel bolts and now it seems to hold. Additionally, the SS300 leaks a lot right after it has been charged. The tank holds about eight litres (about 2 gallons) of water, but it is very, very incomfortable to wear, and impossible to run around with. It is better left a safe place for hit-and-run attacks. With a full tank, you can reload five times. Charging to maximum pressure is difficult, heavy and time-consuming. Charging is best done with the rear end of the blaster to the ground, making use of your own weight to pump. Full charge takes about one to two minutes of intensive pumping. Most of the charge is lost after 3 to 4 seconds of shooting. Two minute pumping -> 3 second shooting... These are the cons of the SS300. Here comes the pros: The SS300 is the only water gun I have tried with a powerful recoil. The tanks on the blaster itself holds a total of 1.5 litres; the first liter goes in the first 3 seconds! The beam is about 8 mm in diameter and the water has an exit velocity of 60 km/h. In other words, a two second shot on a range under 6 meters will make anyone so wet that there would be no need for them to hide from water any more that day. The best way to use this water artillery gun, is to pump it up and leave it hidden somewhere, and then use it for surprise attacks. When you need to recharge, get backup. You cannot recharge and defend yourself at once.